The Aerial Pack with the Kodak SP360 4k for the 3DR Solo Drone is now available. The Aerial Pack (previously announced here) allows you to capture fully spherical aerial 360-degree videos without the drone in the shot, eliminating the need to clone out the drone, which can be a tedious task for 360 videos. Here is a sample 360 video with the aerial pack. The Aerial Pack includes the Kodak SP360 4k Dual Pro pack, which has emerged as having the best video quality for 360 cameras, short of a multicamera rig costing thousands of dollars (to say nothing about the need for expensive stitching software). 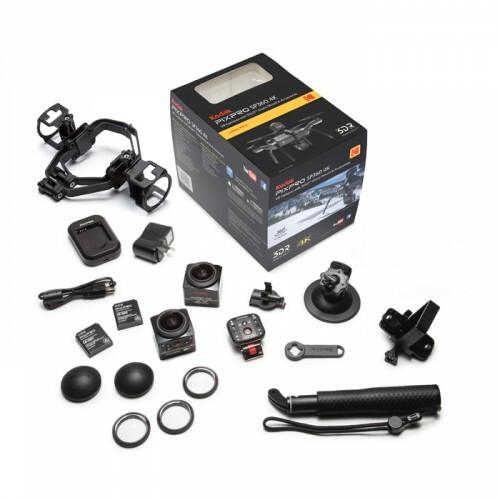 The Aerial Pack includes not only the special dual-camera drone mount but also includes all the accessories that are included in the Dual Pro Pack, including a pair of SP360 4k cameras, the remote for syncing both SP360 4k cameras, and the special back-to-back mount. The Aerial Pack is made only for the 3DR Solo quadcopter drone, which was one of the first drones to make smart flying modes available such as a Cablecam mode. The 3DR Solo is also unique in having several accessories made for professional use such as gimbal for a thermal imaging camera, a gimbaled DSLR-quality aerial surveying camera, and a tethering system for unlimited flight time. The 3DR Solo has a bundle with a gimbal for a GoPro, but if you only want to use it for aerial 360 videos, you can save money by going with the quadcopter only (i.e., no gimbal and no GoPro). 1. The Aerial Pack is available from Amazon or from B&H Photo. If you already have the Kodak SP360 4k Dual Pro and just need the bracket, you can get it from Pixpro. 2. 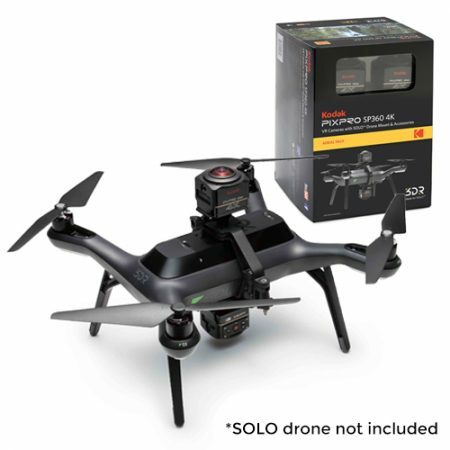 If you would like to purchase the 3DR Solo, please consider buying from Amazon or B&H (they usually offer competitive prices), which would be a welcome way of supporting 360 Rumors at no cost to you! Thank you very much! For related posts, click here or on one of the labels/tags below the sharing buttons.